The holidays are in FULL swing and I couldn't be more excited about it. It's a great excuse to get together with friends, family and everyone who's special in your life. Holidays come with a lot of excess and leftovers. Which in my book is an exciting thing because it means I get experimental in my kitchen on new ways to improvise dishes. This week I'm going to share a few ideas of things you can do with all those random leftovers in the house. 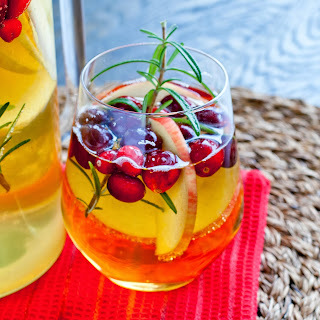 First up, a winter sangria. 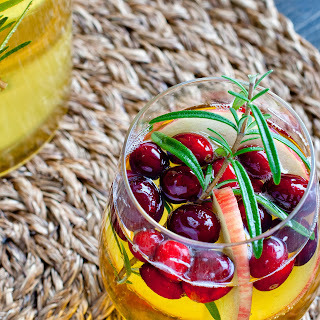 Nothing is more festive than a holiday cocktail, amiright?! I'm a huge fan of sangria so this drink is inspired by the Spanish classic. Is it just my family or do you guys buy a bag of fresh cranberries every year and forget about it in the back of the refrigerator?! This happens without fail EVERY year. I decided to put those bad boys to good use since once again, they were forgotten about. I always like to have a bottle of Martinelli's Sparkling cider for the kiddos but that usually leaves me with an almost full bottle of cider at the end of the night - they just don't drink that much… or maybe they're too little to drink that much. Either way, I made it work in my favor! That plus leftover wine from the evening come together to make this super simple sangria. Leftover rosemary from that roasted turkey?! Yep, we're using everything here! Who's thirsty? Combine all ingredients in a small sauce pan and cook over medium high heat until sugar is dissolved. Set aside to cool. This can be made a week in advance. Just put in a mason jar or tupperware container and into the fridge it goes! I like to leave the rosemary in it to continue flavoring the syrup but also so I know what the heck it is in my refrigerator! 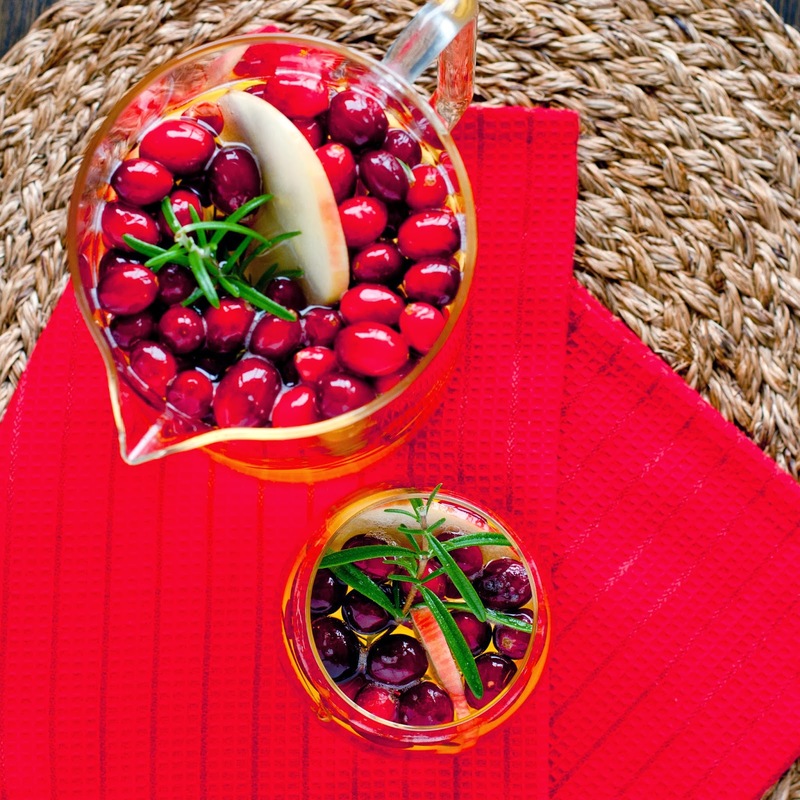 Place your cranberries on a baking sheet in a flat layer in the freezer. We'll use those instead of ice cubes so we don't water down our cocktail. Nothing worse than a watery cocktail! 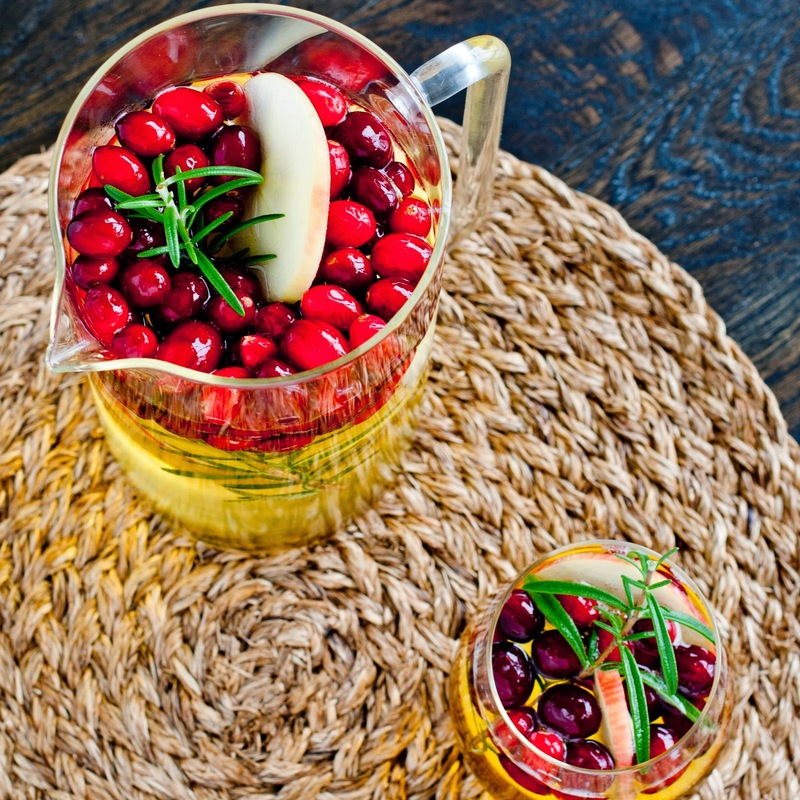 Mix all ingredients (minus the cranberries) together in a pitcher and let it sit for 30 min in the fridge for the mixture to get happy. 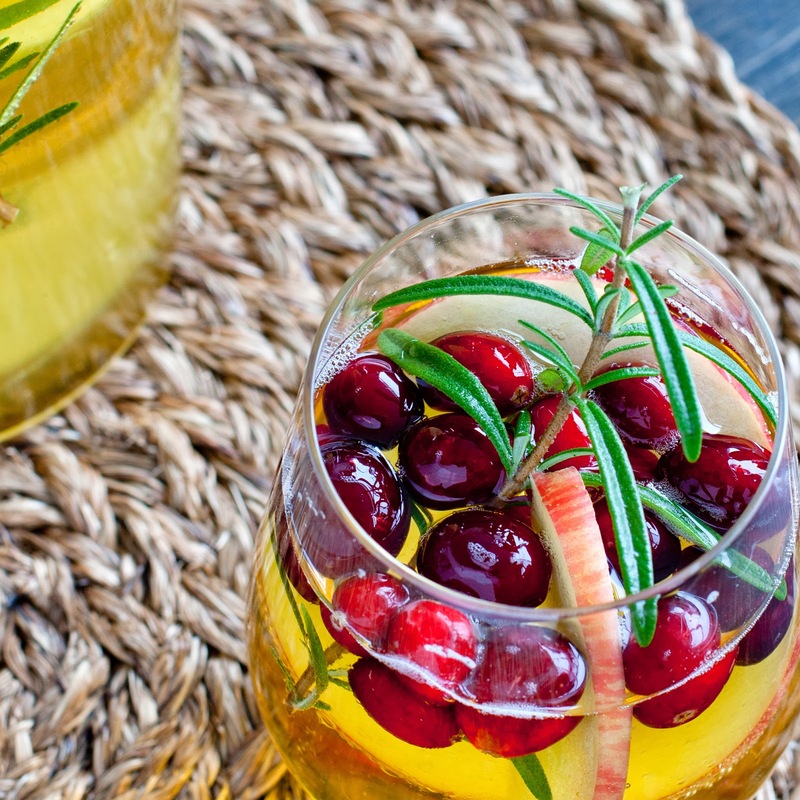 When you're ready to serve, add in the cranberries and fill your glass. Cheers to the holidays! this drink pairs really well with any roasted meat. especially turkey and chicken. the subtle rosemary flavor is really refreshing. if it scares you, go ahead and leave it out. Like the idea of herbs but don't have any rosemary? thyme would be the next best herb to use. basil works too but i prefer to save that for my blueberry basil fizzes. don't have sparkling cider? 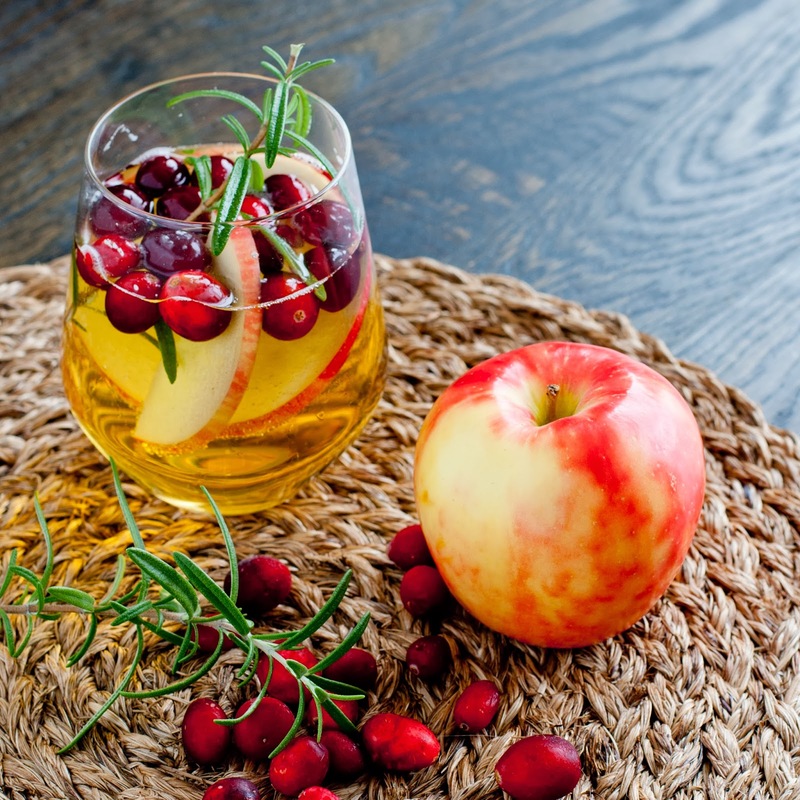 you could totally use regular apple cider. in fact, i think i'd probably prefer it that way! not a fan of cider? try using cranberry or white cranberry juice instead. that would be super tasty! 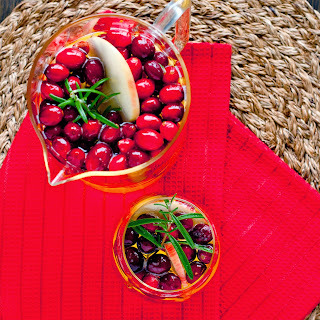 can't find fresh or frozen cranberries? no worries. you can do pomegranate seeds instead. you'll still get that beautiful pop of red color and they're fun to crunch on too. actually, adding them in with the cranberries would be good too! get crazy, it's the holidays! no honey crisp apples at the store?! DAMN! they're the best, but that's ok. you can use ANY apple you have on hand. seriously, they're going to get boozy and really are mostly there for the crunchy freshness. not a fan of pinot grigio or sauvignon blanc? use what you like to drink! moscato or reisling would be just fine. it would also be super sweet… so if you're into that, do it! chardonnay is ok but not my favorite pairing for this drink. again, if you only like chardonnay, do it. life is too short! Thanks for the detailed recipe! Honestly leftovers on thanksgiving give me major anxiety. I will definitely try your recipe and use the leftovers next morning.